Many forms of consumer debt, such as home mortgages, credit card debt and auto loans, permit the borrower to pay down the indebtedness at an accelerated rate or to retire the debt early with a single payment. If a homeowner decides to sell her home, she will use the proceeds of the sale to retire any outstanding mortgage on the home. If someone making payments on an auto loan receives a year-end bonus at work, he may use it to pay down the debt. For a lender, such prepayments are desirable if interest rates have risen since a loan was made. They are undesirable if interest rates have fallen. For most forms of consumer debt, prepayment rates exhibit little correlation with interest rates. They are a source of some uncertainty for the lender, but they do not pose significant risk. An exception is mortgages. Because homeowners with fixed-rate mortgages tend to refinance their mortgages when interest rates drop, there is a pronounced negative correlation between the level of interest rates and prepayment rates on fixed-rate mortgages. This poses a significant risk—called prepayment risk—for mortgage originators. If an originator transfers its mortgages to investors in the form of a mortgage-backed security, it also transfers the prepayment risk to those investors. Because of the significance of prepayment for mortgage-backed securities, the industry has developed metrics for prepayment. These apply to a pool of fixed-rate mortgages collateralizing a mortgage-backed security. The most basic metric has a distinctly actuarial name. It is called single monthly mortality (SMM). It indicates, for any given month, the fraction of mortgages principal that had not prepaid by the beginning of the month but does prepay during the month. For computational purposes, if a mortgage does prepay in a given month, its scheduled principal payment for that month is not considered part of the prepayment. A related concept is the conditional prepayment rate (CPR), which is annualized SMM. Specifically, CPR indicates, for any given year, the fraction of mortgages principal that had not prepaid at the beginning of the year that does prepay during the year. A simple way to communicate the potential for a pool of mortgages to prepay over its lifetime is to project a constant CPR. A constant CPR projection is not particularly realistic. However, it can be useful for communicating the potential for a given pool to prepay. Constant CPR projections facilitate comparisons between pools. A shortcoming of such projections is that they ignore a tendency for prepayments to be modest in the early years of a mortgage. To address this shortcoming, the Public Securities Association (PSA) introduced a metric for projecting prepayments over the life of a pool. The metric is called, simply enough, PSA. A pool is said to have 100% PSA if its CPR starts at 0 and increases by 0.2% each month until it reaches 6% in month 30. It is a constant 6% after that. A PSA of 50% indicates CPRs that are half those of 100% PSA. A PSA of 150% indicates CPRs that are one-and-a-half those of 100% PSA. This is illustrated in Exhibit 1. Exhibit 1: A pool of mortgages is said to have 100% PSA if its CPR starts at 0 and increases by 0.2% each month until it reaches 6% in month 30. It is a constant 6% after that. Other prepayment scenarios can be specified as multiples of 100% PSA. Note that PSA indicates prepayment rates. It assumes a constant rate after 30 months, but actual cash flows due to prepayment decline over time as outstanding principal is diminished. This is illustrated in Exhibit 2. 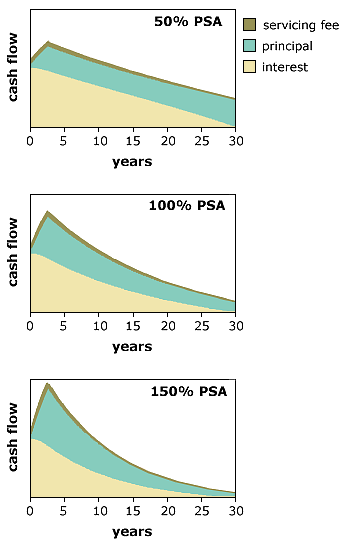 Exhibit 2: Cash flows—servicing fees, principal and interest—are illustrated for a mortgage pass-through at PSAs 50%, 100% and 150%. Collateral is 30-year fixed-rate mortgages paying an average mortgage rate of 9.5%. Service fees are 0.5%.